Zero Desigze lives! This long-awaited project has a habit of popping up and then disappearing from the radar just as suddenly. Anyway, it’s just gotten a pachinko game, but an anime will definitely follow later on. The game website is [here]. I have translated practically everything that the site has right now. Thanks to Captain Harlock for breaking the news [here]. To whet your appetite watch the promo vid below:the first 3 minutes deal with the universe of Zero Desigze, the last 2 minutes with the mechanics of the game [boring stuff to most of us]. Practically all of those first 3 minutes is footage from the promotion movie and the interview in the site. Translations follow. There are three main buttons on the site. I’ll go from left to right. A. The first button links to a movie promoting the game. Itsuki Almighty of the triple-hearted Ardis!!! B. The second button goes to an interview with Leiji Matsumoto on the pachinko game. Question: Tell us about the birth of this project? Answer: I’ve written many works over the decades, and now I wanted to express my own tastes, as much as I could fit, into this work. This is something that I developed spontaneously, naturally. Question: Could you give us some highlights? Answer: You will see a lot of things popping up on the screen at the beginning: characters, robots and so on. I want you to enjoy all of these relationships and how the game is built around them. When X shows up then you find how it relates to Y. The more you play the more you’ll understand. Question: How will this project develop further? Answer: I have a plan to air this story in animated form in the future. I have never liked short stories that one reads and puts down when they’re done. I like stories that go on forever, stories on a grand scale. Therefore I’d like this animation to be long as well, something that people can remember years later and look back to as a fun experience. C. The third button leads to a screen with information on the world of Zero Desigze. Here’s a translation of all the text on-screen. The text at the bottom of the screen reads: A story about the still unseen future universe. The cinematic scenes in the game totally rock! 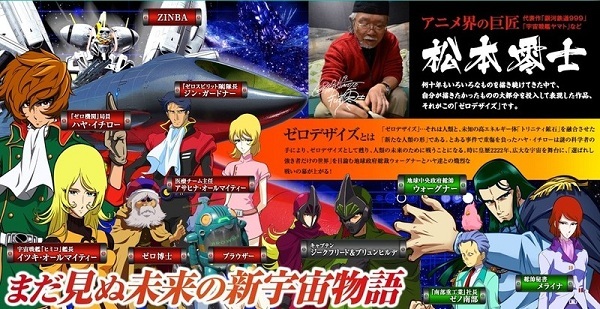 Leiji says in the interview that he has no plan to quit and will continue working. He also says the traffic accident he had September last year slowed him down for a while but he’s perfectly fine now. ~ by Haloed Bane on April 15, 2012. Looks like he’s just throwing everything in there this time. Something odd: the two sisters are Itsuki Almighty (captain of Himiko) and Asahina Almighty (medical chief). Have you seen those names together elsewhere? I have. Haruhi’s friends: Itsuki Koizumi and Mikuru Asahina (Itsuki is both a male and female name). So this isn’t as dead as i thought it was…cool the got Aniki to sing! At first I was like, isn’t he really old? and then I thought, wait, he’s tons of years younger than the creator of the thing. 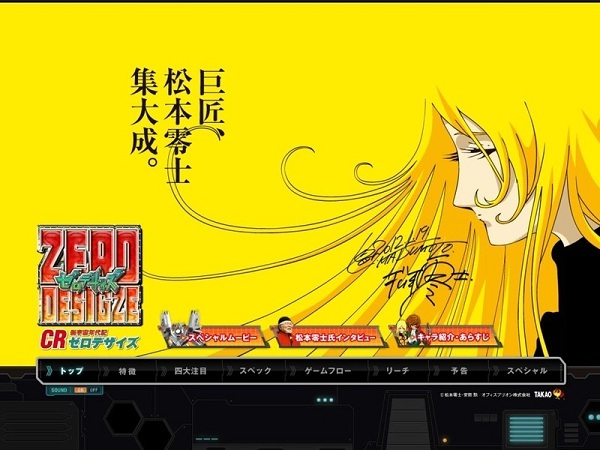 if leiji can still do his thing so can he. Well you need particular style of theme music for a good Leiji project, so if you want a hero theme song you have him or Jam Project do it from what I understand. And then the Yamato 2199 song is by the same guy as well. Classy stuff.